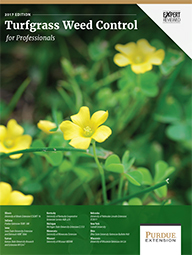 With new herbicides entering the market, new techniques for controlling weeds, and with more and more difficult to control weeds the “Turfgrass Weed Control for Professionals” manual has been updated to address many of these issues. Check out the 2019 edition! It is a must have for every turfgrass manager! One of the most common weed control recommendations for winter annual weeds is “keep it mowed and let them die because of the warmer weather”. Well right now it is March 30th and it is prime winter annual weed growing weather. Yeah, it might warm up in the next week but what if this is what we recommended in February when we have a week of 75 deg F weather. We would have been waiting about 2 months before mother nature would have taken care of that weed problem. So here is some information about winter annual weeds and control. The plant with the little tube shaped purple flowers that have been showing up turfgrass is called henbit. If you are not sure this is what you have, check the stems. If they are square rather than round, you have henbit. Square stems are an indication that it is in the mint family. 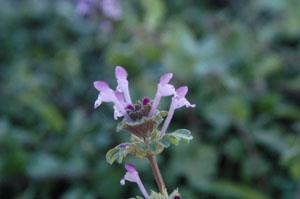 Henbit is a winter annual broadleaf with kidney shaped leaves, opposite arranged, with rounded teeth on the leaf margin. The upper leave surround the stem. It really likes disturbed, moist areas in turf and landscape beds. Don’t get it mixed up with purple dead nettle or ground ivy, they are similar looking weeds. Most broadleaf weed herbicides are effective. 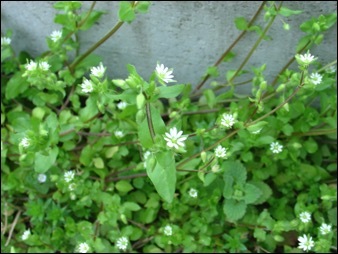 A plant that also is low growing but has round stems and tiny white flowers is chickweed. 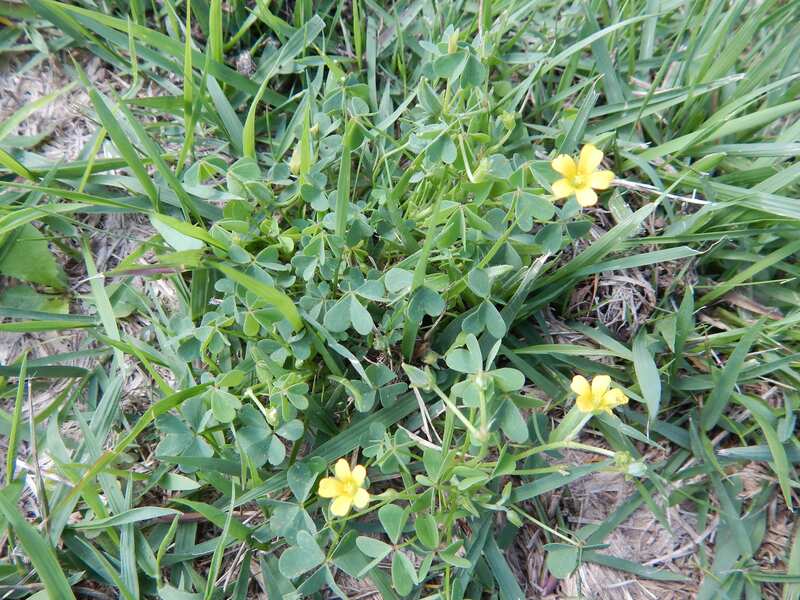 Chickweed is also a winter annual and starts to grow in the fall. They spend the winter as small plants and so most people do not pay much attention to them until they start to flower in the spring. Remember, these are winter annuals that will die as soon as the weather turns hot. You can keep the turf mowed and you can let nature take its course. As you can see this year it got warm, then cold, then snowed, then warm again, dry and now 50’s – low 60’s and raining. So waiting may not be an option for golf courses, parks, sports complexes, and lawns. We may need a jump start to get rid of those weeds. Ok so here is a scenario. We wait and let the warm weather kill off the winter annual weeds. Now there is a void in the turf. What happens in voids in our turf as it warms up? Crabgrass starts to germinate. Hope you got your preemerge herbicide out for crabgrass! Fall is obviously the best time to kill broadleaf weeds but these weeds will germinate throughout the Fall to Spring. The majority germination in October but they will continue to germinate through the spring especially when we have those warm fall and winter days. So a Fall application in November may not get complete control because more will germinate after that application. Thats why a Spring application may be needed as well to clean up these weeds along with some dandelions that may have also survived. Most broadleaf weed herbicides are effective especially ones that are three-four way mix. FYI, at this time the weeds are more mature and harder to control. Last week I got a lot of good feed back on the Homeowner Do-It-Yourself Lawn Calendar for Cool-Season Grasses so I decided that it would be good to go ahead and get the warm-season lawn calendar out there for everyone that is manageing zoysiagrass, bermudagrass or buffalograss. The following is a lawn calendar for zoysiagrass and bermudagrass. 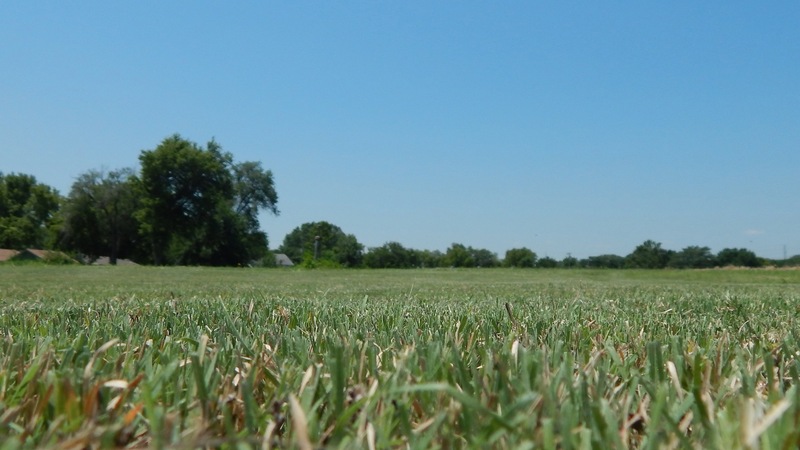 Buffalograss, also a warm-season grass, but we will cover that separate because the management of buffalograss is a little different then zoysiagrass and bermudagrass. Apply crabgrass preventer between April 1 and April 15, or apply preventer when the eastern redbud is in full bloom. 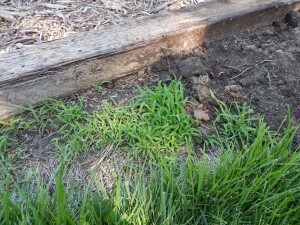 This year we are getting a little warmer sooner but remember this cold snap that we just had would have killed any crabgrass if it had germinated. If using a product with prodiamine (Barricade), apply two weeks earlier. 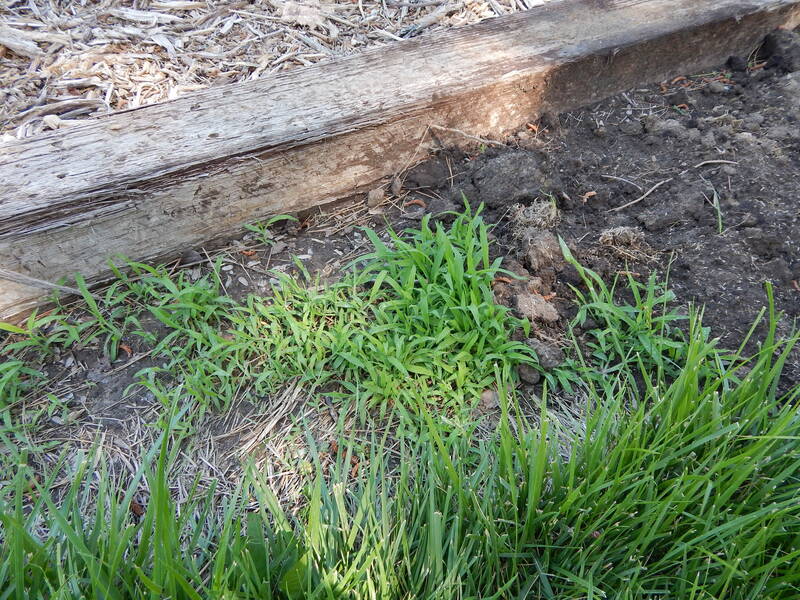 Crabgrass preventers must be watered in before they will start to work. Fertilize with 1 lb. of nitrogen per 1,000 square feet per application. Follow the recommendations on the bag. More applications will give a deeper green color, but will increase mowing and may lead to thatch buildup with zoysiagrass. 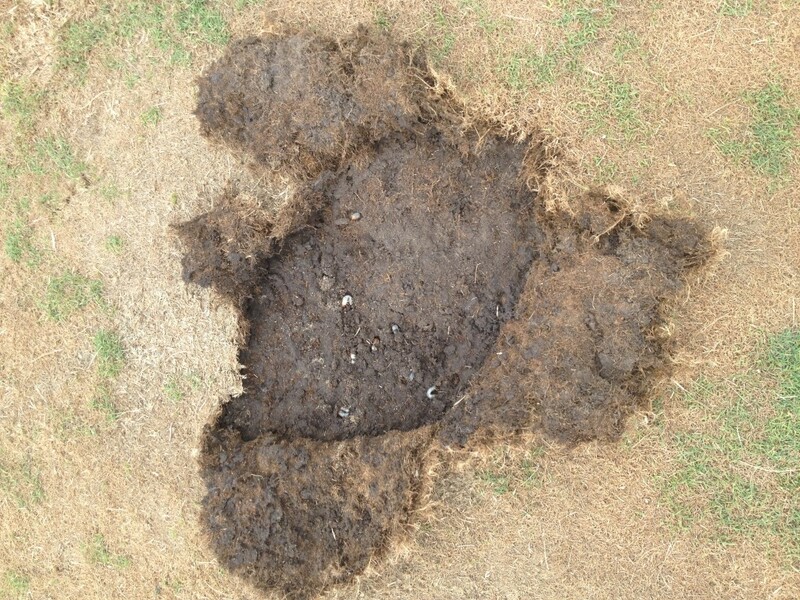 Bermudagrass can also have problems with thatch buildup but thatch is less likely with Bermuda than zoysia. Bermudagrass – Use two to four applications. Zoysiagrass – Use one to two applications. Too much nitrogen leads to thatch buildup. Remember to look and see if you are using a quick release nitrogen source or a slow release nitrogen source. If you use a quick release source then it is immediately available but only lasts a couple weeks. Thats why you would have to make a couple of applications like it is listed above. If you are going to use a slow release source it will tell you on the bag how long the product will last. Therefore, you might not have to make as many applications. So generally you want to use a total of 2 to 4lb. of nitrogen per 1,000 square feet per year for bermudagrass and 1 to 2 lb. of nitrogen per 1,000 square feet per year for zoysiagrass. Spray for broadleaf weeds if they are a problem. Treat on a day that is at least 50 degrees F. Rain or irrigation within 24 hours reduces effectiveness. Use the rates listed on the label for all products mentioned. It is as simple as that! Enjoy! In 2016 Dr. Aaron Patton and Daniel Weisenberger reached out to surrounding universities to collaborate on producing a multi-state Turfgrass Weed Control for Professionals Publication. There are 11 states, including Kansas, that worked together to help produce the 2017 edition. 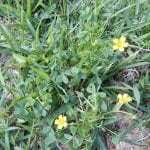 It contains images and information for identifying 105 different weed species. Which herbicide works best for each weed. Includes notes and comments on each herbicide. Provides handy comparisons of broadleaf herbicide ingredients. 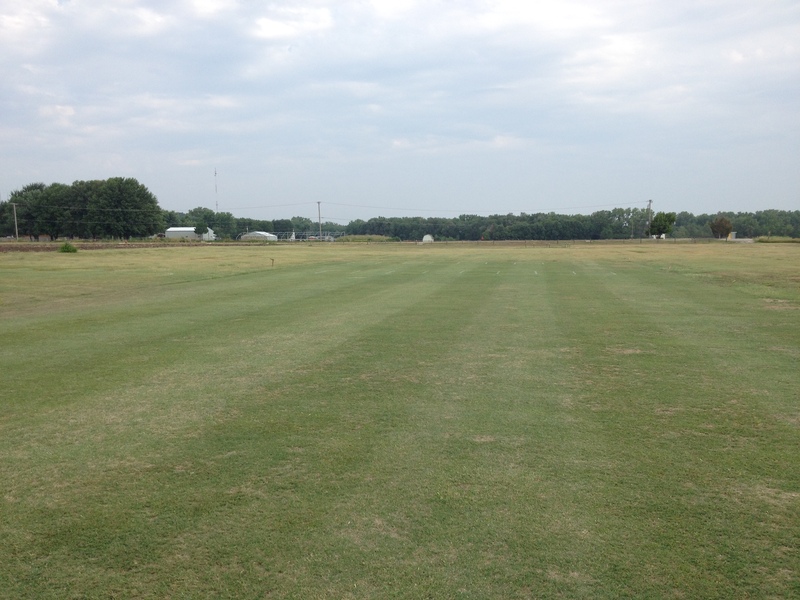 Just a couple weeks ago the turfgrass team held the Annual Kansas Turfgrass Field day in Manhattan, KS at the Rocky Ford Turfgrass Research Center. At one of the stops Dr. Jared Hoyle talked about new products that are on the marked for post-emergent broadleaf weed control and pre-emergent crabgrass control. If you couldn’t make it out to field day here is a short little video about what you missed. It’s not too early to start your home lawn management plan! “Spring is just right around the corner!” Yeah, right… I think immediately right after I typed that a winter weather advisory went into effect for Manhattan. It seems like spring will never make it but don’t let it catch you off guard. Right now is a good time to start planning your lawn calendar for the year. In one of the latest Horticulture Newsletters, KSU Horticulture Extension Associate, Ward Upham, outlined a calendar for cool-season grasses. This is a good outline that you can modify to fit your home lawn. 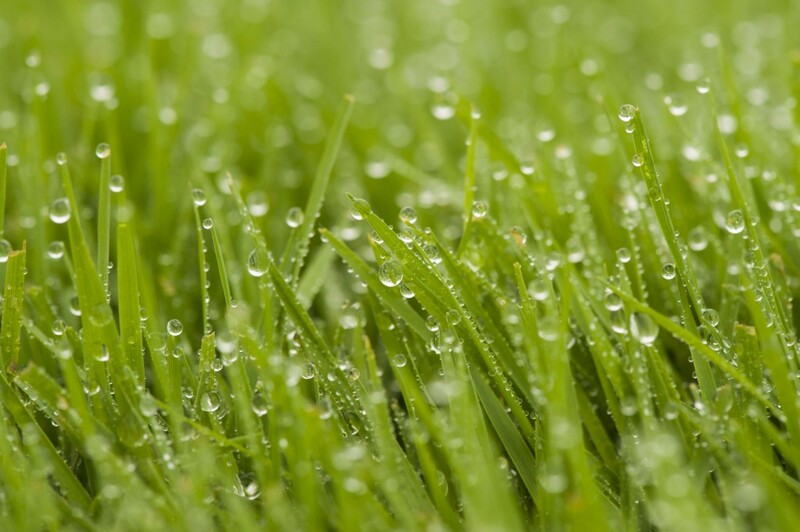 The following suggestions are for cool-season grasses such as Kentucky bluegrass or tall fescue. Zoysiagrass, bermudagrass, and buffalograss are warm-season grasses and require a different maintenance regime. Spot treat broadleaf weeds if necessary. Treat on a day that is 50 degrees or warmer. Rain or irrigation within 24 hours of application will reduce effectiveness. Apply crabgrass preventer when redbud trees are in full bloom, usually in April. The preventer needs to be watered in before it will start to work. One-quarter inch of water will be enough to water in any of the products mentioned in this calendar. Remember that a good, thick lawn is the best weed prevention and may be all that is needed. Fertilize with a slow-release fertilizer if you water your lawn or if you receive enough rainfall that your turf normally doesn’t go drought-dormant during the summer. If there are broadleaf weeds, spot treat with a spray or use a fertilizer that includes a weed killer. Rain or irrigation within 24 hours of application will reduce effectiveness of the weed killer, but the fertilizer needs to be watered in. If you are using a product that has both fertilizer and weed killer, wait 24 hours after application before watering in. 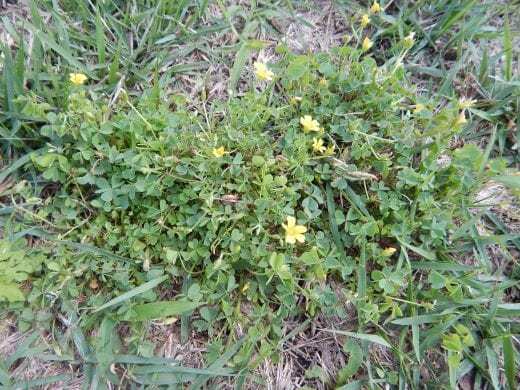 Apply second round of crabgrass preventer by June 15 – unless you have used Dimension (dithiopyr) or Barricade (prodiamine) for the April application. These two products normally provide season-long control with a single application. Remember to water it in. 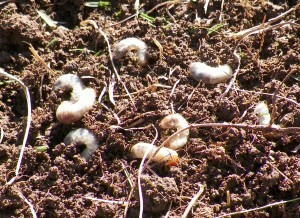 If grubs have been a problem in the past, apply a product containing imidacloprid during the first half of July. This works to prevent grub damage. It must be watered in before it becomes active. If you see grub damage, apply a grub killer that contains Dylox. Imidacloprid is effective against young grubs and may not be effective on late instar grubs. The grub killer containing Dylox must be watered in within 24 hours or effectiveness drops. Fertilize around Labor Day. This is the most important fertilization of the year. Water in the fertilizer. Fertilize. This fertilizer is taken up by the roots but is not used until the following spring. Water in fertilizer. Spray for broadleaf weeds even if they are small. Broadleaf weeds are much easier to control in the fall than in the spring. Spray on a day that is at least 50 degrees. Rain or irrigate within 24 hours reduces effectiveness. Use label rates for all products!